As this was our most viewed post over Christmas we thought we’d revisit this recipe. We really didn’t need much of an excuse as we’d enjoyed it so much the first time we’d cooked it, but it over-delivered. Yum! We’re also adding a great method for cooking brown rice as the two pair very well. Put the rice, 475ml water and salt in a small, heavy-based pan with a tight-fitting lid (if the lid’s not tight just put a layer of tinfoil between the pot and the lid to keep the steam in) and bring to the boil. Cover tightly, turn the heat down to very, very low and cook for 45 minutes. This is easy to do if you have gas but harder with electric so we recommend using two rings so you can get the heat to low quickly. Leave the pan off the heat, still covered with the lid, for 10 minutes before you serve it. (Method by Madhur Jaffrey, Curry Easy, Ebury Press, 2010). 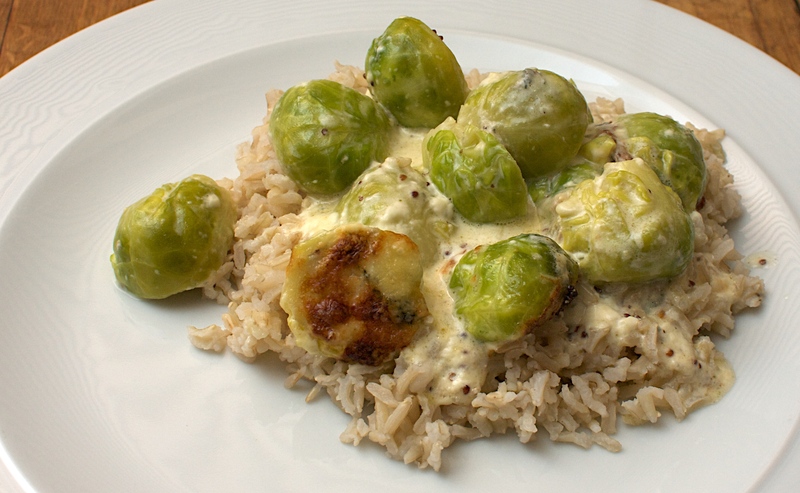 Wine suggestion: There’s a lot going on in this dish: cream, salty cheese, earthy Brussel Sprouts … you need some acidity to counter the richness and cream; a touch of sweetness, or round fruitiness to balance the salty Stilton; and an earthiness to compliment the lot. We drank a New Zealand Chardonnay which went well, but we think a Chardonnay from the Jura, a Sylvaner from Alsace or a very well made Aligote from Burgundy would work even better.